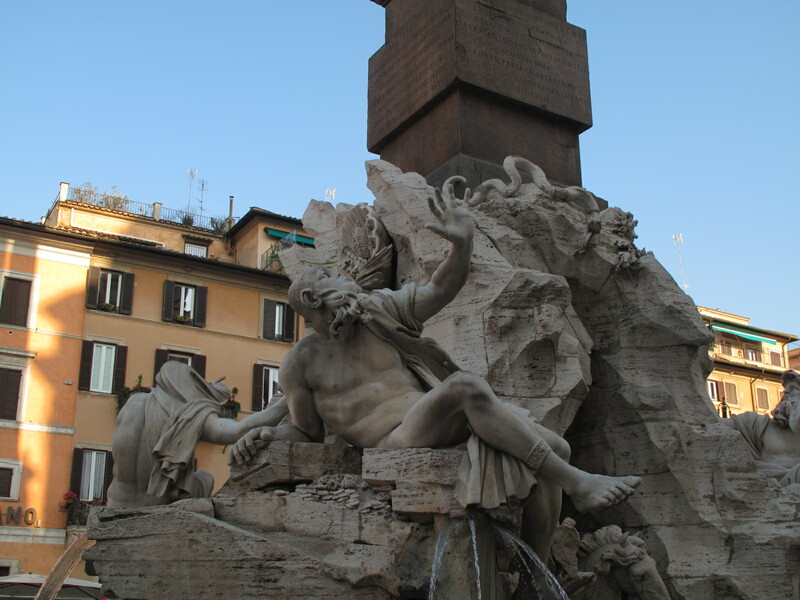 Another warm and sunny day in Rome. Perfect weather for roaming among the ruins. I remember the first time seeing the interior of the Colosseum and being disappointed, I think because I had already seen the amphitheatre in Nimes which is in better condition. 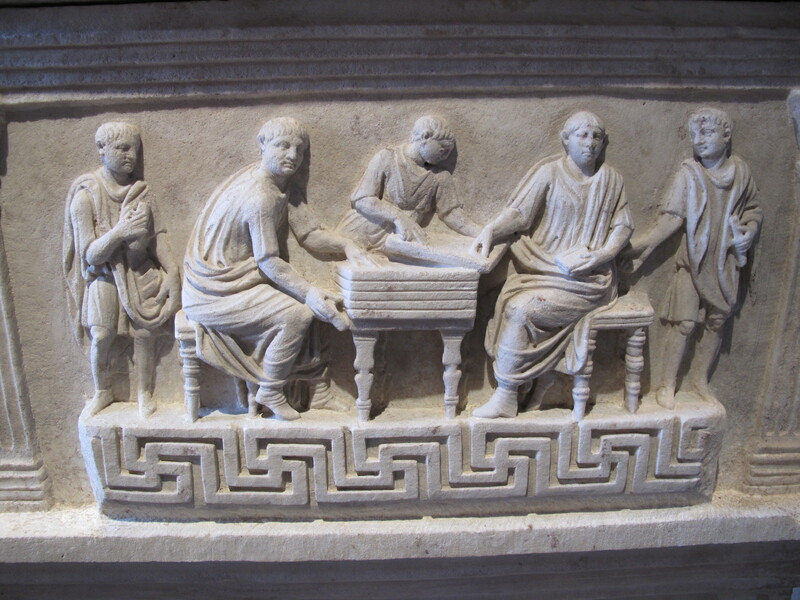 Nothing much has changed, of course, but they did have a great little exhibit on literacy in the Roman world, called La Biblioteca Infinita inside. 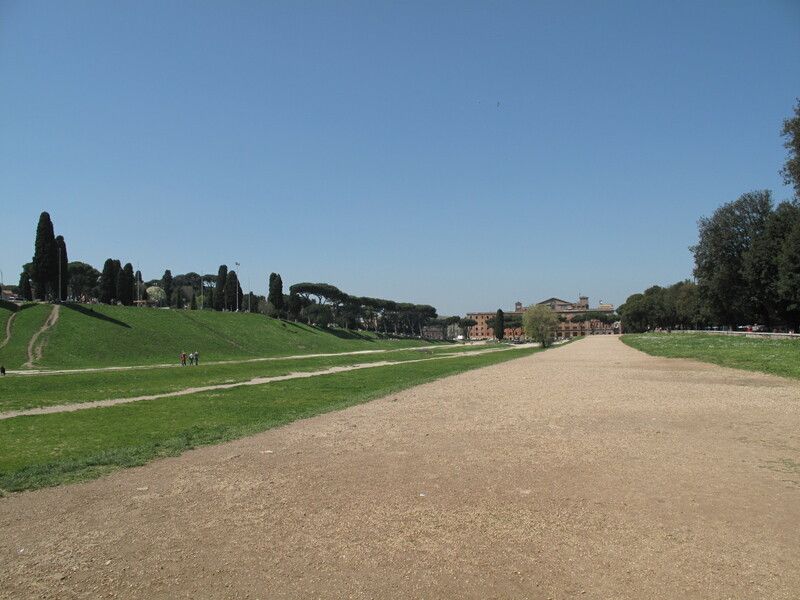 Site of chariot races, gladiator games, wild animal hunts and other spectacles, the Circus Maximus is Rome’s oldest public space dating from C6 BC. It could hold 250,000 spectators by C1 AD. 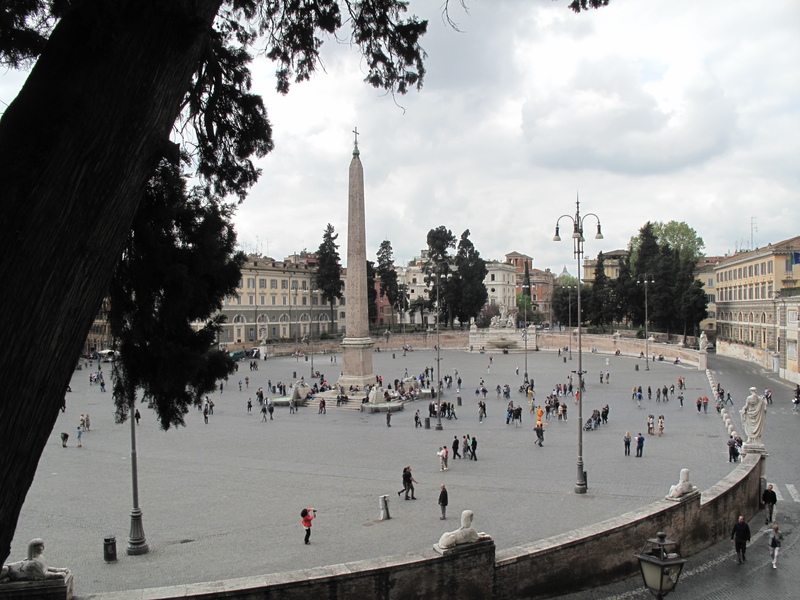 In 10 BC Augustus took an obelisk dating from 1280 BC from Egypt and placed it in the circus. 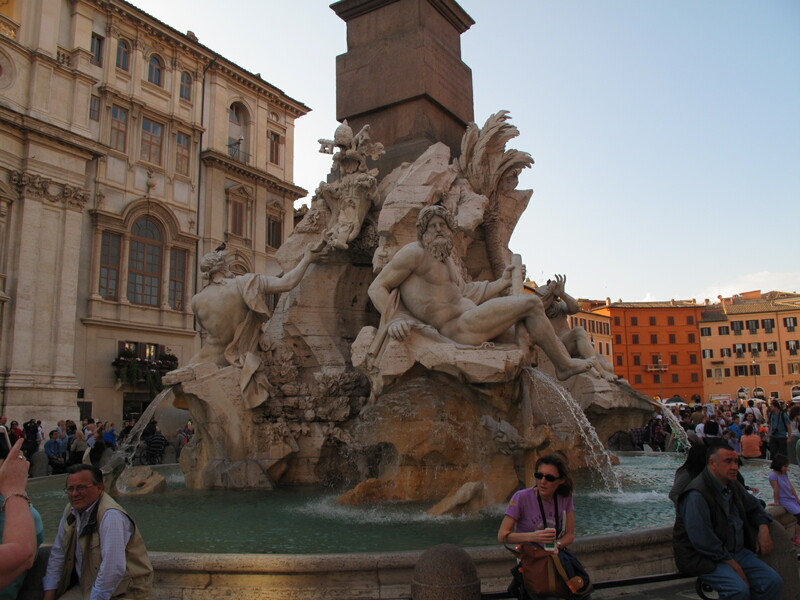 This was later moved (in AD 1587) and placed in the Piazza del Popolo where it is today. This temple dates from the late C2/early C1 BC. 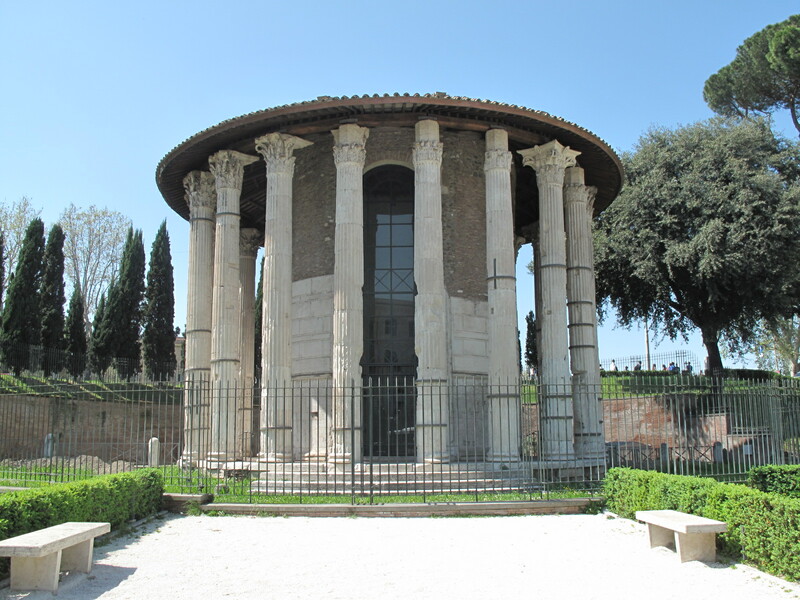 Sometimes called a temple of Vesta, it is not known to which god or goddess this temple was dedicated. It may have been to Hercules. It survived because it was converted to a church known as St. Stephens in AD 1132. This temple replaced an earlier one on the site and dates from 80-70 BC. It survived almost intact because it was converted to the church of St. Mary in AD 872. 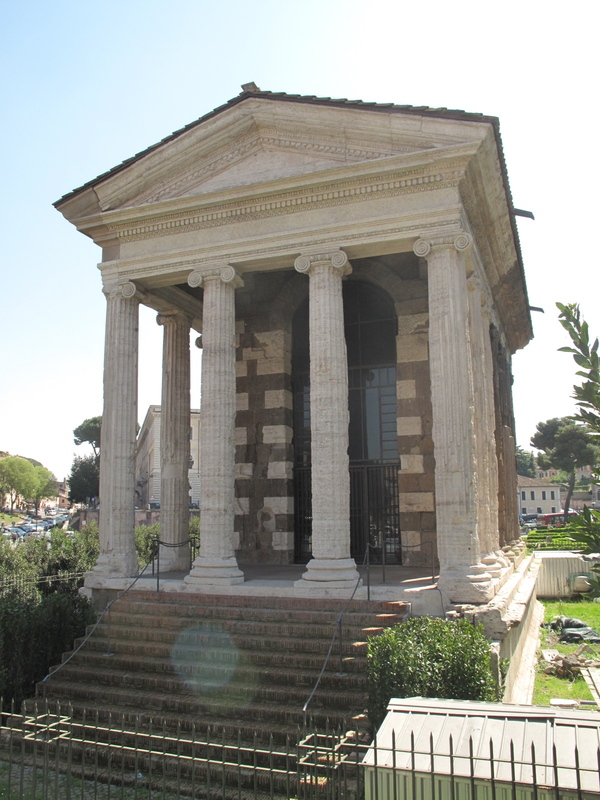 This temple was located near the ancient Tiber port and is thought to have been dedicated to the harbour god Portunus. 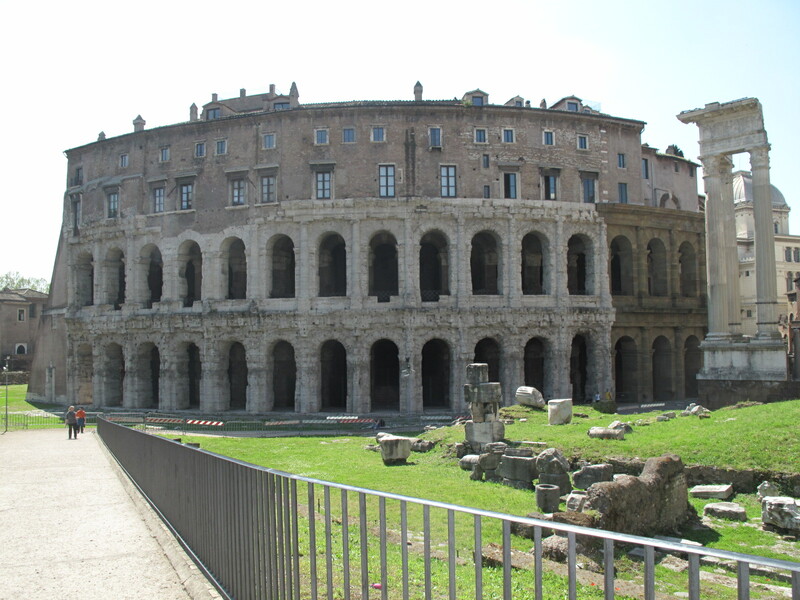 Julius Caesar planned this theatre to rival the one built by Pompey but was killed before it was completed. 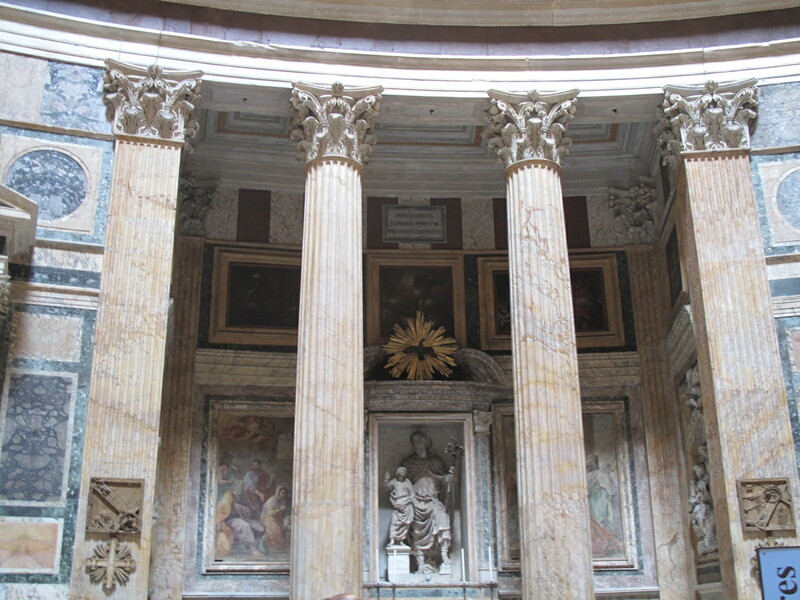 Augustus built it and named it for his nephew Marcellus who died in 23 BC. 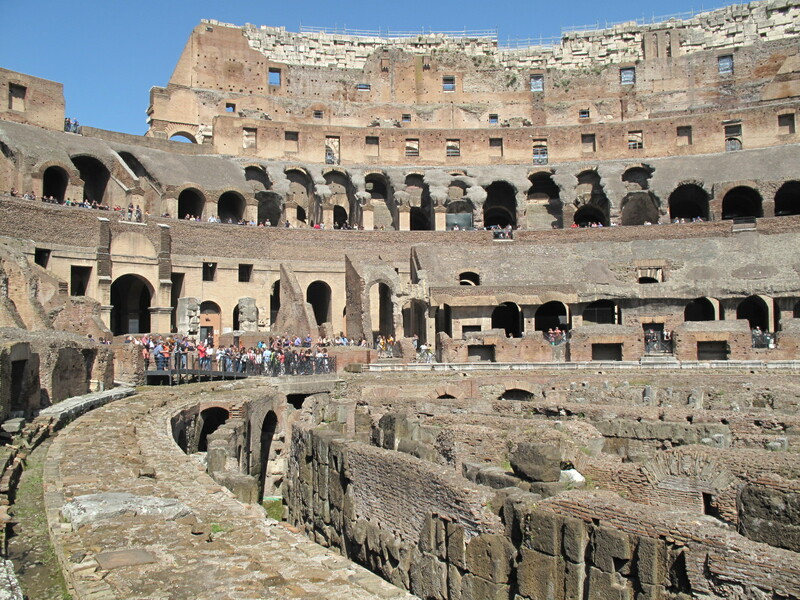 It once held 20,500 people and inspired theatre building around the empire. Now it contains a modern apartment building. This was the most impressive building to me the first time I came to Rome. 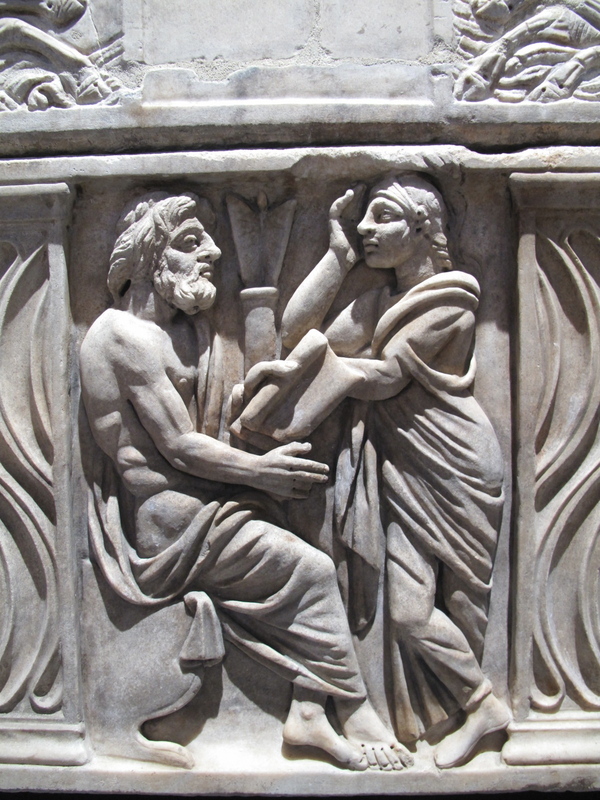 It is almost 1900 years old (dates from AD 125) and still has its luxurious marble interior intact. 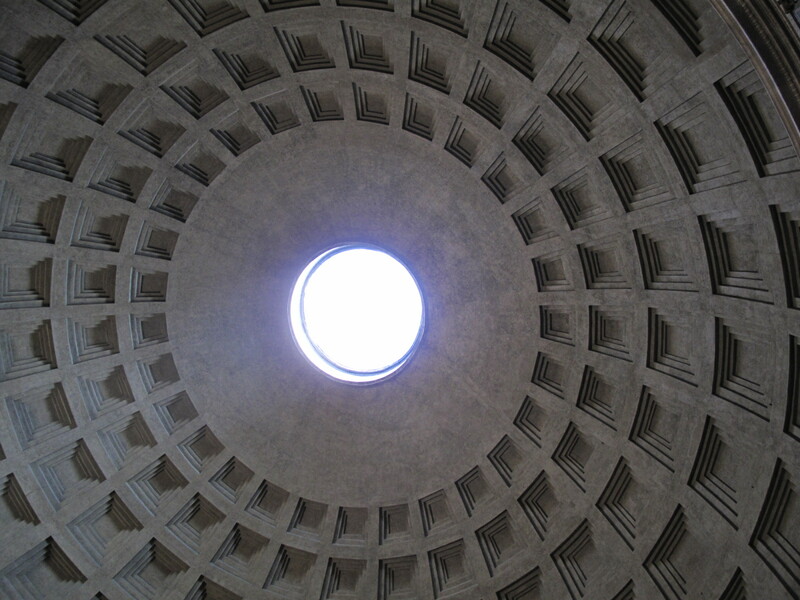 Its dome held the world record for a concrete span until 1958, according to the Oxford Archaeological Guide to Rome. 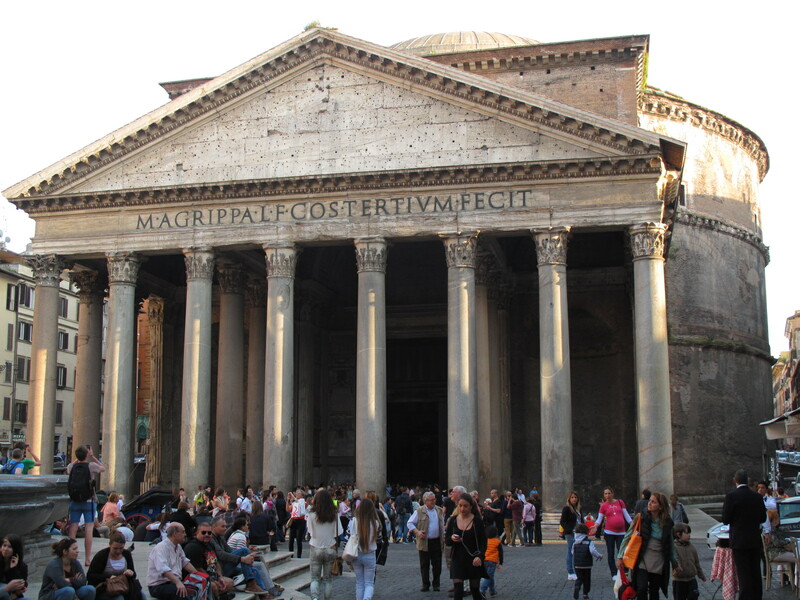 It is the third Pantheon (temple to all the gods) on this site and was built by Emperor Hadrian but was rededicated in the name of the first Pantheon builder, Marcus Agrippa. It was converted to the church of St. Mary of the Martyrs in AD 608. 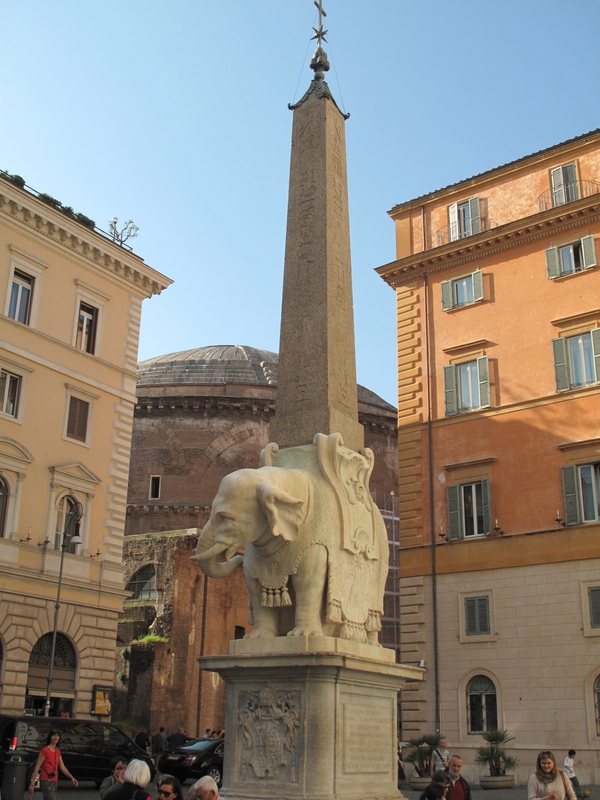 Behind the Pantheon in the Piazza della Minerva in front of the church of Santa Maria sopra Minerva is an Aswan Egyptian Obelisk from the 6C BC, held up by a little elephant carved by Bernini in AD 1667. The obelisk was found at this site where a Temple of Isis once stood. 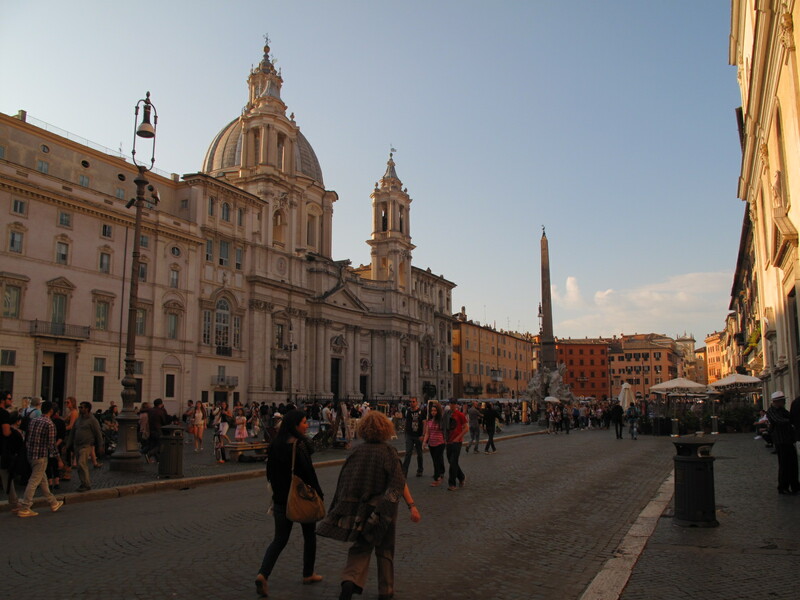 This famous piazza was once the Stadium of Domitian built in AD 86 and held athletic and gladiatorial games. It still has the same shape as the stadium, curved at the north end and straight at the south. Seating for 30,000 would have been in the same place the surrounding buildings are in. April 28, 2014 in Rome 2014.